We used to believe that behind every dramatic transformation was a series of climactic circumstances (bulldozers in the backyard, jackhammers in the kitchen), but this breathtaking before and after is an overdue reminder that you can change your home for the better without all the noise and disruption. Ahead, Peters schools us on transforming a tired space into a forever home with timeless materials, elevated swaps, and maxed-out storage. By the time Peterscame on board, her clients had made a few significant changes to the home—namely removing a second staircase off the entry that led to what was previously an indoor pool. In lieu of upending the home’s original footprint, Peters opted for streamlined cosmetic upgrades that would withstand the test of time. 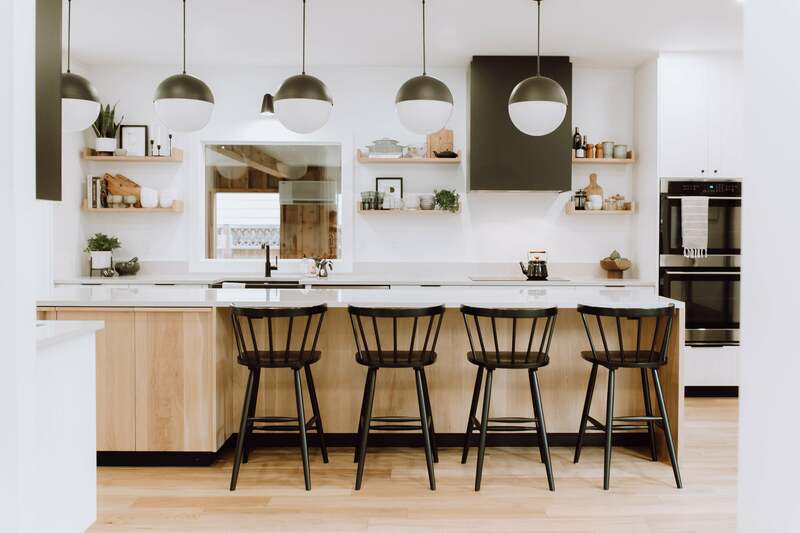 “They wanted things to be easy to take care of, so that’s where we came in with the quartz countertops and matte black fixtures—nothing that they had to fuss over,” says Peters. While a dramatic departure from its former all-wood state, the kitchen’s layout remained more or less the same. The addition of a spacious eat-in island and discreet white cabinetry made all the difference. Even the smallest changes can leave a lasting impact on something that has long been regarded as ubiquitous. Just take the floating shelves, for instance. After some trial and error, Peters and her millworker came up with an edgy way for the clients to show off trinkets, trays, and treasured dishware. “I hate doing the same thing from project to project, so I thought, Hey, why don’t we add ends to the shelves. I think it adds just another layer of interest,” says the designer. In terms of mudroom essentials, this ultra-organized nook checks every box on our list. In anticipation for daily messes that span all four seasons, Peters’ top priority was carving out enough room for bulky winter gear, cleaning supplies, and everything in between. On either side of the built-in bench are floor-to-ceiling cabinets—one doubles as a broom closet, and the other one contains hidden shelving for baskets, shoes, and out-of-season ware. To spare everyone the trouble of rifling through a shared mishmash of gloves and scarves, Peters divvied up room for four separate drawers below the bench. Just off the mudroom, guests will discover a high-contrast powder room with a major wallpaper moment. The friendly print not only fit within the couple’s streamlined aesthetic, but it was a bonus opportunity to showcase their free spirits and their penchant for hosting parties. “[The wife] said to me one day, ‘I want someone to come in here after two beers, sit on the toilet, stare at the walls, and try to figure it out,’” laughs Peters. Given the fact that her clients are in the plumbing business, Peters’ first focus upstairs was to show off the fixtures in the master bathroom. “We needed to make this look like the coolest plumber’s bathroom ever,” she explains. A free-standing tub and spacious walk-in shower were the two most important features on the client’s list. Peters’ own personal must-have came in the form of statement glass.“I was sitting at home one day and I was looking at these black smoked glasses that were my grandfather’s and I was like, Smoked glass is kind of cool. I wonder if we could do this on a shower enclosure?” recalls Peters. The treatment turned out to be cool and within the means of the budget. Sticking to a budget is only half the battle with any project. Setting a budget that’s realistic is, as any designer well knows, the first crucial step. In this case, hardwood floors presented the ultimate challenge. After falling in love with an option that was out of their price range, Peters started her flooring search from scratch in the hope of finding a wallet-friendly alternative that fit their style. Back upstairs, Peters made room in the budget for more splurges (the deep Kohler tub) and saves (the standard white subway tile). Her rule for making the most of your finances? Budget for the level of finishes you want.